Landlady arrested for setting tenants’ apartment ablaze - BlogIT with OLIVIA!!! 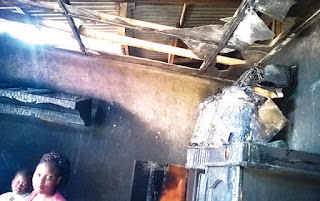 The Lagos State Police Command has arrested a landlady, Mrs. Nike Azeez, for allegedly setting fire to her tenants’ apartment in the Ijegun area of the state. PUNCH learnt that Azeez, who lives on Two Brothers Street, was arrested on Thursday by the Isheri-Oshun Police DivisionIt was gathered that the landlady allegedly set fire to the apartment, rented by a couple – Shakiru Adeleke and Abosede – during an altercation on Tuesday around 8.30am. It was gathered that the landlady allegedly grabbed the couple’s two-year-old boy, Adam, and dropped him on the ground, before he was rescued by neighbours. Punch learnt that the altercation bordered on Azeez’s alleged insistence that Shakiru and his family should pack out of the house. A neighbour, who spoke on condition of anonymity, said, “The cause of the disagreement was that the landlady did not want the family in the house again. Punch learnt that Azeez allegedly absconded from the house on Tuesday, after the matter was reported at the police station. However, she was arrested on Thursday. Speaking with PUNCH Metro, the tenant, Shakiru, said, “I rented this house two years ago and I have a small generator which I used. Few weeks ago, the landlord said I should stop using the generator, which I ignored. Shakiru’s wife, Abosede, told Punch that she had taken Adam to a hospital. She said on the telephone, “During the commotion caused by our landlord’s wife, she threw my son over the fence and the boy hit the ground and injured his head. When contacted on the telephone, the landlady’s husband, Jamiu Azeez, admitted that his wife beat up Abosede, Shakiru’s wife, but denied that she set fire to the house. He said, “I was not there. I only know she went to the apartment to fight and left. People accused her of setting fire to it, but my wife has denied it. “My tenant’s wife usually cooks in the parlour, and the cooking could have started the fire. My wife said she only beat up the tenant’s wife. “Abosede had once brought thugs to the house to beat up my wife. So, my wife went to revenge. My tenant’s wife also keeps petrol in the house. I had to go and report her to the police to stop doing all that. We settled this matter, but my wife was not aware that we had settled the matter. The Lagos State Police Public Relations Officer, SP Dolapo Badmos, confirmed the incident.